Today I release new update of UV Outliner (2.2) with improved export. As I already told in the previous post – rich text format is broken, because exported outline can be used nowhere. But that is not the case with HTML. So I improved export to HTML and made it the default one. Here is an example of exported outline. When you want to copy/paste part of the document to another application – you’ll have better results with the “Export as a list” option. Now you can just copy from the export window (which is actually a browser) and paste to virtually any rich text application – Word, OpenOffice Writer, Email client and so on. Also in case you prefer exporting to a non-default format all the time, export settings are saved now. I ofter work on some outline just to send the result to someone by email. Most of the time that person doesn’t use outliner software, and I want the outline still be available to him right away. My documents usually very simple, just some list of items. Unfortunately no of these methods will work all the time and here is why – there is no standard way in rich text format to represent a list of items. If you save document in .rtf – will it opens correctly in WordPad, Microsoft Word or OpenOffice? Will you be able to open the document and modify it in any primitive way? 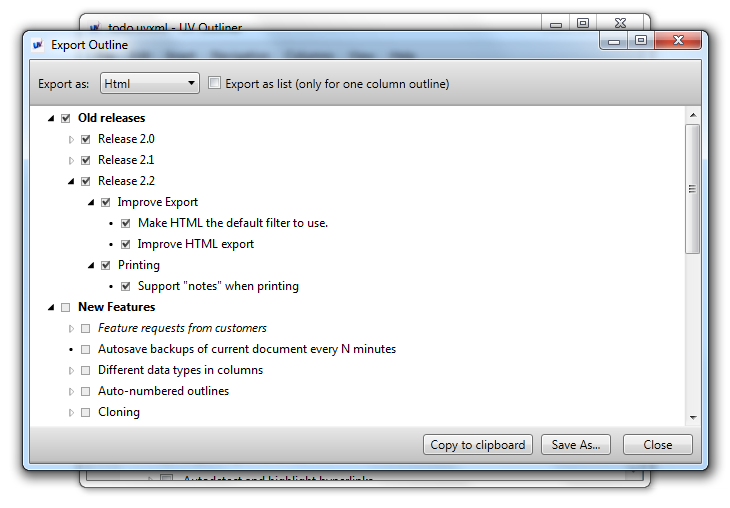 What will happen if you open the document with a list and copy-paste it from one app to another? The answer to all these questions – you can’t predict. All these apps (WordPad, Word, OpenOffice, etc) store lists differently. Your email client stores lists differently, and there is no way outliner could show you a document you can copy and paste in any application hoping it will appear the same. That is very sad. So I plan to add support for ODF format or Docx, but i’m not sure. Could you please comment – what you do if you want to send the outline to someone else? Is there some ways you can overcome troubles? Actually, I improved import to HTML. I think this will solve this trouble with rich text format for a while. It’s been some time from the last release. however it is obvious to me that the speed of development is very slow. There are few reasons for this, but the main one is that I can spend only half an hour a day for it. I know there are a lot of people out there dreaming about good outliner for Windows. I among them, and I think that you too. And if you a good WPF developer and want to participate in creating the best outliner for Windows, please write me a letter. Together we’ll be able to speed things up dramatically. Finally, I glad to announce that multicolumn support was added to UV Outliner! 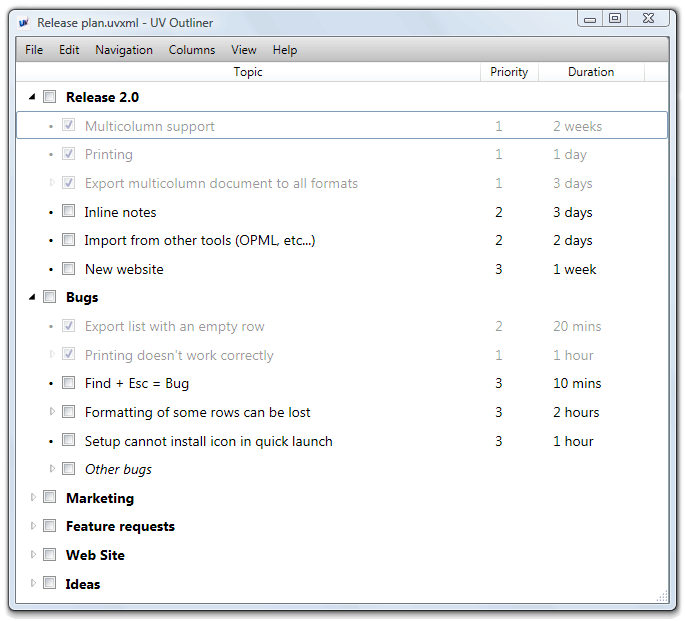 UV Outliner 1.5 becomes the first modern single pane outliner for Windows with multiple column support in the world ;-). This version currently does not support “data types” in columns, but they will be supported very soon. A lot of headaches with multicolumn implementation were related to supporting export to the .rtf format. Unfortunately, due to the limitation of the RTF format, there still some problems in certain circumstances with the generated multicolumn .rtf file.